Not to be confused with Strategic thinking. Strategic planning is a process and thus has inputs, activities, outputs and outcomes. This process, like all processes, has constraints. It may be formal or informal and is typically iterative, with feedback loops throughout the process. Some elements of the process may be continuous and others may be executed as discrete projects with a definitive start and end during a period. Strategic planning provides inputs for strategic thinking, which guides the actual strategy formation. Typical strategic planning efforts include the evaluation of the organization's mission and strategic issues to strengthen current practices and determine the need for new programming. The end result is the organization's strategy, including a diagnosis of the environment and competitive situation, a guiding policy on what the organization intends to accomplish, and key initiatives or action plans for achieving the guiding policy. The first two elements relate to factors internal to the company (i.e., the internal environment), while the latter two relate to factors external to the company (i.e., the external environment). These elements are considered throughout the strategic planning process. Data is gathered from a variety of sources, such as interviews with key executives, review of publicly available documents on the competition or market, primary research (e.g., visiting or observing competitor places of business or comparing prices), industry studies, etc. This may be part of a competitive intelligence program. Inputs are gathered to help support an understanding of the competitive environment and its opportunities and risks. Other inputs include an understanding of the values of key stakeholders, such as the board, shareholders, and senior management. These values may be captured in an organization's vision and mission statements. Strategic planning activities include meetings and other communication among the organization's leaders and personnel to develop a common understanding regarding the competitive environment and what the organization's response to that environment (its strategy) should be. A variety of strategic planning tools (described in the section below) may be completed as part of strategic planning activities. What is the organization's business or interest? What is considered "value" to the customer or constituency? Which products and services should be included or excluded from the portfolio of offerings? What is the geographic scope of the organization? What differentiates the organization from its competitors in the eyes of customers and other stakeholders? Which skills and resources should be developed within the organization? The output of strategic planning includes documentation and communication describing the organization's strategy and how it should be implemented, sometimes referred to as the strategic plan. The strategy may include a diagnosis of the competitive situation, a guiding policy for achieving the organization's goals, and specific action plans to be implemented. A strategic plan may cover multiple years and be updated periodically. 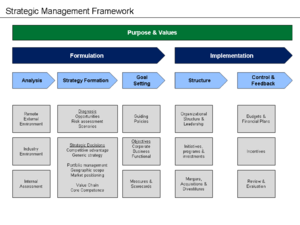 The organization may use a variety of methods of measuring and monitoring progress towards the objectives and measures established, such as a balanced scorecard or strategy map. Companies may also plan their financial statements (i.e., balance sheets, income statements, and cash flows) for several years when developing their strategic plan, as part of the goal setting activity. The term operational budget is often used to describe the expected financial performance of an organization for the upcoming year. Capital budgets very often form the backbone of a strategic plan, especially as it increasingly relates to Information and Communications Technology (ICT). Whilst the planning process produces outputs, as described above, strategy implementation or execution of the strategic plan produces Outcomes. These outcomes will invariably differ from the strategic goals. How close they are to the strategic goals and vision will determine the success or failure of the strategic plan. There will also arise unintended Outcomes, which need to be attended to and understood for strategy development and execution to be a true learning process. Scenario planning, which was originally used in the military and recently used by large corporations to analyze future scenarios. The flowchart to the right provides a process for classifying a phenomenon as a scenario in the intuitive logics tradition. Process for classifying a phenomenon as a scenario in the Intuitive Logics tradition. Balanced Scorecards and strategy maps, which creates a systematic framework for measuring and controlling strategy. Responsive Evaluation, which uses a constructivist evaluation approach to identify the outcomes of objectives, which then supports future strategic planning exercises. Simply extending financial statement projections into the future without consideration of the competitive environment is a form of financial planning or budgeting, not strategic planning. In business, the term "financial plan" is often used to describe the expected financial performance of an organization for future periods. The term "budget" is used for a financial plan for the upcoming year. A "forecast" is typically a combination of actual performance year-to-date plus expected performance for the remainder of the year, so is generally compared against plan or budget and prior performance. The financial plans accompanying a strategic plan may include 3–5 years of projected performance. Categories 3 and 4 are strategic planning, while the first two categories are non-strategic or essentially financial planning. Each stage builds on the previous stages; that is, a stage 4 organization completes activities in all four categories. For Michael C. Sekora, Project Socrates founder in the Reagan White House, during the cold war the economically challenged Soviet Union was able to keep on western military capabilities by using technology-based planning while the U.S. was slowed by finance-based planning, until the Reagan administration launched the Socrates Project, which should be revived to keep up with China as an emerging superpower. Strategic planning has been criticized for attempting to systematize strategic thinking and strategy formation, which Henry Mintzberg argues are inherently creative activities involving synthesis or "connecting the dots" which cannot be systematized. Mintzberg argues that strategic planning can help coordinate planning efforts and measure progress on strategic goals, but that it occurs "around" the strategy formation process rather than within it. Further, strategic planning functions remote from the "front lines" or contact with the competitive environment (i.e., in business, facing the customer where the effect of competition is most clearly evident) may not be effective at supporting strategy efforts. ^ a b c d e Mintzberg, Henry; Quinn, James B. (1996). The Strategy Process: Concepts, Contexts, Cases. Prentice Hall. ISBN 978-0-132-340304. ^ Ingram, Richard (2015). Ten basic responsibilities of nonprofit boards (third ed.). Washington D.C.: BoardSource. p. 42. ISBN 1-58686-148-4. ^ a b Rumelt, Richard P. (2011). Good Strategy / Bad Strategy. Crown Business. ISBN 978-0-307-88623-1. ^ a b c Porter, Michael E. (1980). Competitive Strategy. Free Press. ISBN 978-0-684-84148-9. ^ Drucker, Peter (1954). The Practice of Management. Harper & Row. ISBN 978-0-06-091316-8. ^ Spaniol, Matthew J.; Rowland, Nicholas J. (2018). "Defining Scenario". Futures & Foresight Science. 1: e3. doi:10.1002/ffo2.3. ^ Michael C. Sekora (Feb 2, 2018). "Opinion: The Cold War Budget Tool That Could Save The Pentagon". Aviation Week & Space Technology. Wikimedia Commons has media related to Strategic planning. John Argenti (1968). Corporate Planning – A Practical Guide. Allen & Unwin. L. Fahey and V. K. Narayman (1986). Macroenvironmental Analysis for Strategic Management. West Publishing. M. Lorenzen (2006). "Strategic Planning for Academic Library Instructional Programming." In: Illinois Libraries 86, no. 2 (Summer 2006): 22–29.